Too bad that went out of style at least 5 or 6 years before I was born… anyways. Not even one week into Tokyo life but things are BLISSFUL. I haven’t been this happy in oh… a long long time. Here are some pictures from the new apartment. Its a 2DK but fairly spacious, we’ve managed to find room for all our stuff. Not bad! We are also located really near the station, it took my about 7 minutes going with the baby car so its a pretty decent walk. Not too far but not so close that the sound of trains is constantly in our ears. Theres also a very spacious veranda/patio and a bathroom which I didn’t photograph, because really… no one wants to see that. I had my first “girls day out” with Lulu and cutie pie Noah today. We went to the Lalaport and had a yummy burger lunch and did some shopping. There was also a nifty play place for the little ones and Sakura crawled around like a madwoman and “played” with some other kids – well if you could trying to pull their hair and take their pacifiers. Noah was a chilled out little dude who stayed put but I could see the “I am going to be doing this real soon” glimmer in his eyes. haha. Anyways pumped on some yummy starbucks and the happiness that come from having a satisfying gab session with a girl friend I came home to find an offer for a translation project in my mailbox. A fairly “big” project that will have me tied to my computer all weekend but the proceeds will give me “play funds” for at least 2-3 months. Not 100% certain I will get it – I will find out tomorrow so cross your fingers. We NEED a baby gate though since the munchkin is incredibly mobile now and will come into the kitchen to try and crawl up my legs whenever I try to get anything done so that is what we really need to get. Speaking of Miss S – heres a recent pic! She’ll be 9 months in about two weeks. Time is flying… I am guessing she will be walking sometime in June, she’s crawling like a mad woman and pulling up on EVERYTHING she can get her paws on. Yes a great day all round and FANTASTIC news about the possible translation job! Awesome! I really need to pull my finger out of my bum and find some more part-time work that is “noah-friendly”!! LOVE your mat by the way. Is it new? The blue one? I think it is the colour I like the most. Note to self: MUST START BABYPROOFING! The rug was something we bought in Niigata for only 3000 yen – I liked to color as well its a fairly nice rug quality-wise. Baby proofing for you is going to be a challenge with all that space!! You’ve got a lot of areas to cover (lol) maybe the only bad thing about having such a big living room! I love the look of your new apartment – it looks great with all your new stuff in it. I can’t wait to come and visit!! Very jealous of your date with Lulu today – it sounds like you all had a great time. Wonderful news about the translation job. I have my fingers crossed you will get it!! The only think that would have made it better would have been if you and Leilah could have joined us. yay for things going well in tokyo for you! Sounds like a great day. Good luck with the translation job, too. Wow so many compliments on the rug lol. Good to hear things are going well on you side of Tokyo. Looking forward to our meetup on Monday. I also must get on the baby proof wagon, but first I need to throw a whole bunch of stuff away. really looking forward to seeing you too!!! Wow you look really moved in – otsukaresama! That is one mischevous looking little one 😉 She’s settling in to the new place well then? thanks!! she seems to be doing well – she was a bit out of sorts the first couple days but I think she’s forgotten our old place by now! 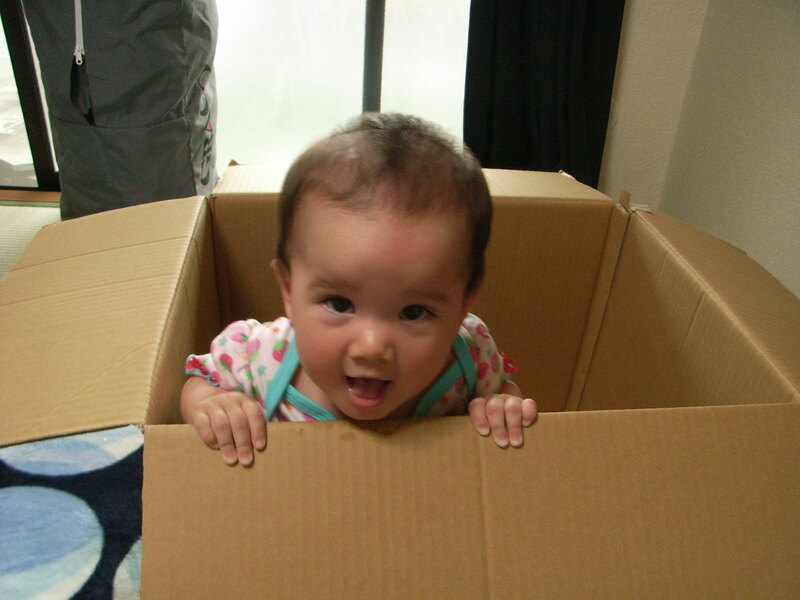 There is something about babies in boxes that is just so adorable! I have my fingers crossed for you for the translation job, that sounds amazing! It is nice having friends nearby, def. part of the allure of Tokyo. Now its just trying to find times when people are free to meet up. It’s so nice to hear you having more and more happy moments! I’m so excited for you! Tokyo is such a great place, to find anything and everything. The apartment looks niiiice! Not so old-school. Haha. 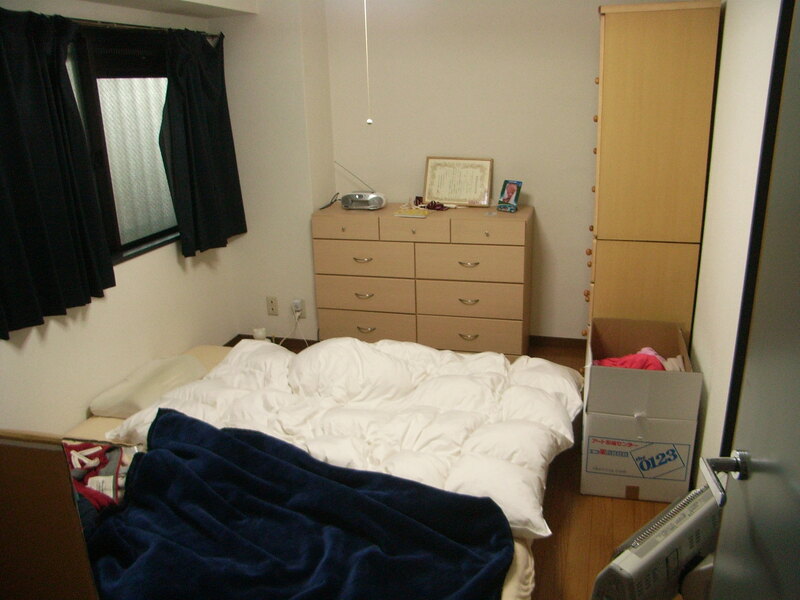 Takeshi always said “We are not getting an apartment with tatami mats and such.” He’s definitely a ‘modern’ guy. 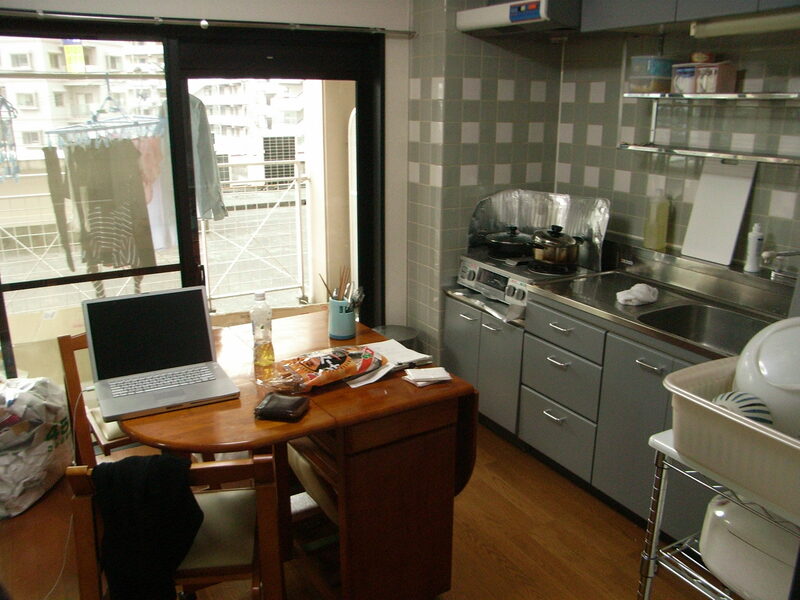 our apartment is about 20 years old so its fairly “new” for tokyo! Your place looks really nice! Baby in box photos always way cute. Can’t beleive she will be walking soon!! Ryu has started a forwards/sideways bum shuffle thing that really only happens when I’m not looking. Turn round and he has made his way to the other side of the room almost. On his tummy though it still only backwards. Good to hear you sounding happy again. Girls lunches – gotta be good for stuck in house with small baby cabin fever. Hope the translation goes ahead. sounds like hes starting to get active! Glad to hear you’re much happier now in Tokyo! oh, and the place looks really great too! The apt looks great btw!